First, before I get to this plate of huevos rancheros, let me say “thank you” for sharing your feedback on the survey. It’s still open so if you haven’t had a chance I would love to hear from you. So often, I wonder what you all are thinking about and I did a little happy dance when the surveys started rolling in. After reviewing the submissions so far I feel like we’re all on the same page with the same goals – we want to eat better! We want wholesome real ingredients! Simple is better! We want to be creative! I’m right there with you. Thank you for providing so much inspiration. And I think today’s recipe captures the spirit of what we’re trying to do. 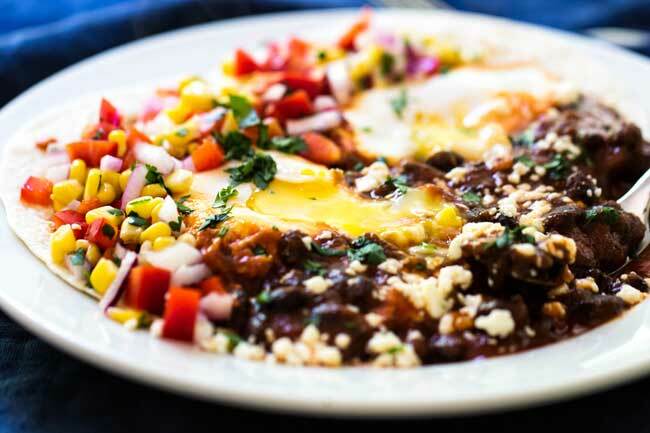 Huevos rancheros, in its simplest form, is just eggs served in a spicy sauce with tortillas. I’ve had many restaurant versions, most of which were in New Mexico, served on giant plates with all sorts of add-ons like fried potatoes, refried beans, and plenty of melted cheese. Oh, so delicious yet the sort of breakfast that leaves in you in a food coma for the rest of the day. 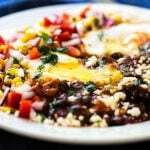 I avoid food comas these days, so I’ve taken some liberties with a traditional New Mexican huevos rancheros breakfast. My version is its lighter more colorful cousin. Chipotle peppers in adobo sauce bring heat and smoky flavor to the sauce. Look for cans of chipotle peppers in the Mexican food section at the grocery store. I mixed up some corn, bell pepper, and red onion with a splash of lime to spoon over the eggs and sauce. It adds a hit of acidity and freshness that cuts through the spicy sauce. If you can’t find fresh corn, use frozen. Just submerge the kernels in some water to defrost them first. I used flour tortillas, but corn tortillas would work well, too. Queso fresco is a Mexican-style crumbling cheese. I found it in my local grocery store, but if you have trouble tracking it down feta cheese is a good substitute. P.S. The photo above shows two servings on one plate. Mix the ingredients for the fresh veggie topping in a medium bowl. Place it in the refridgerator while you prepare the eggs. Heat the olive oil in a medium skillet. Add the tomato puree, chipotle pepper and sauce, black beans, and seasonings. Stir and bring to a simmer. Add the eggs, cover, and cook until the whites are set (about five minutes). To serve: place an egg on each tortilla. Add some beans and sauce. Top with the fresh veggies and garnish with the cheese and cilantro. I am not an experienced cook, but I managed this, and it ended up delicious and beautiful, if I don’t say so myself. I only used a third of the chipotle chilies and very little of its sauce because it was so spicy. I added green chilies to compensate. I added mango to the salsa and avacado as a topping, putting it all on crisp corn tortillas. Thank you so much for such a tasty and healthy meal my family loved. I love the adjustments you made – so glad you liked it! This is certainly not the way huevos rancheros are made in Southern Arizona. You stateda that people pile too many other ingredients on them but that’s what you did. 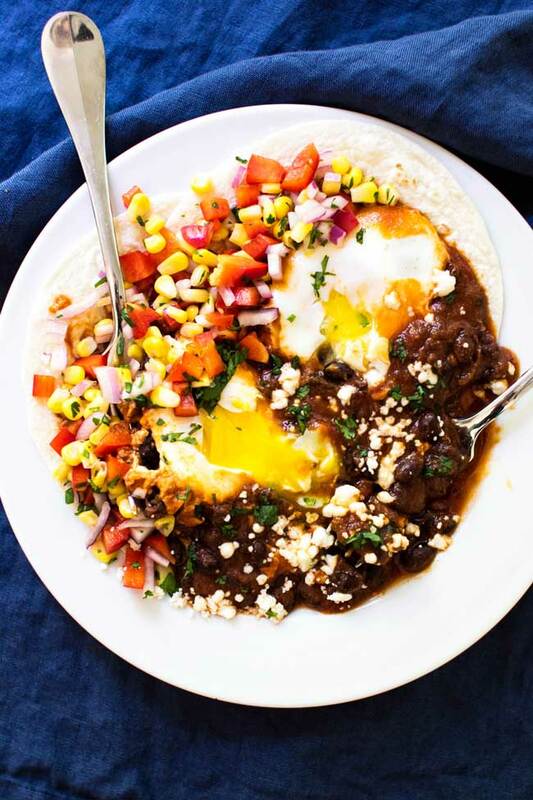 Huevos Rancheros are made with a crispy corn tortilla, topped with refried beans, fried eggs and a good salsa. Shredded lettuce and salsa are usually served on the side. This looks too pretty to eat! Looks and sounds delicious and quick. Will surely give this one a try!